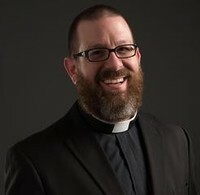 Resurrection Anglican Church is lead by God through His servant Father Joshua Gilliam as its rector. He was born and raised in the Concord/ Kannapolis area, and lives in Enochville with his wife, Nelva and their five children, Paola, Addison, Emmanuel, Elijah, and Zoe. Father Joshua graduated from Concord High School, and studied music under Betty Williams of Concord who was his voice teacher for several years. He is a Graduate of Queens University in Charlotte, NC where he completed his B.A. with a major in Spanish and a concentration in Music. What a joy to hear him sing. God’s drawing led Joshua to experience him in may different and varied ways, but Joshua was always drawn to the liturgy. Joshua developed a special love of the liturgy and the sacraments which led Him into the Anglican Church. Life took him the long way to his calling as a priest with time spent in the Army chaplain training and as a police officer. He travelled to Costa Rica as part of a Spanish language program. In 2008, two good Christian friends of his shared the gospel with him and introduced him to evangelical services. He asked God if he knew him and when there was no answer he realized a hole in his faith. After a 6 p.m. service one evening, he gave himself to Jesus and has never looked back. He explained how instrumental Jeff James and David Graham were to guide him and help him recognize his call to ministry. He completed his Masters of Divinity through Liberty Theology Seminary in Virginia, and the Doctor of Ministry from Hood Theological Seminary in Salisbury, NC. He researched several liturgical churches and determined that the Anglican Church of North America was the best fit his theological and sacramental understanding of the Scriptures. The liturgy and worship of the Anglican Church is a natural fit for the way God wired Joshua for worship. The Anglican faith has building blocks that connect the heart of Father Joshua to God. Father Joshua says, “The Bible, The Creeds, The 39 Articles of Faith, and the Book of Common Prayer are the tools available to Anglicans to help Anglicans to stand firmly upon the Scriptures and understand that culture does not dictate our beliefs.” He explains that he loves the way that Anglicans stand firmly on Christ as revealed in the Bible and that it does not need to be interpreted in light of modern social inventions. Father Joshua was ordained as an Anglican priest on April 25 2014 by Bishop Steve Wood. Representatives from eight different churches and denominations attended. Father Josh sets aside Friday Evenings and Saturdays as family days. Father Joshua spends upwards of 10 hours a week to prepare for each Sunday sermon. Father Joshua says, “breaking open the word of God to the people of God is the highest of vocations because it reaches into the heart of God. Pastors today must take seriously the call to preach, which is a call to prepare.” His parishioners love his sermons because of his diligence in defining and applying the scripture to their daily lives. Father Joshua’s office and library was made to create an environment to enter into the presence of the Lord. This space set apart to study and prepare God’s word for his extended family at Resurrection Anglican Church and is a witness to his belief that, “as for me and my home, we will serve the Lord”. You can also often see him studying and relaxing with friends at the French Express Coffee Shop in Kannapolis. Father Joshua is a very imposing figure standing over six feet tall and sports a full beard. He loves the outdoors and sports. He states that his children were raised with a soccer ball in their cribs. They also help out in his new church by being acolytes and ringing the church bell for Sunday services. He is a very dedicated father and husband, who has a full-time job as the under-shepherd who is “feeding God’s sheep”. Resurrection Anglican Church welcomes and opens its doors to all people to be transformed as we "Exalt Jesus and Worship Him."